Steve Gewecke's Alhambra High School team let one slip away in April 2015 and Gewecke knew his team needed to do more if they expected to make the playoffs, according The Whittier Daily News. "We're fighting for our playoff lives," Gewecke told The Daily News. "You can forget about the league (title). We have to get in. We have to find a way to win a game." Gewecke served as Alhambra's baseball coach having served years earlier as a player himself. He brought with him knowledge from two seasons spent in the pros. He played both those seasons at single-A Springfield. Gewecke's pro career began in 1989, signed by the Cardinals as an undrafted free agent out of USC. He also played at the University of Nebraska. He went to Arcadia High School in California. He started with the Cardinals at Springfield. He went 2-0 over 13 outings, two starts. He got his first win in August, where he went five innings and allowed two hits against Madison. 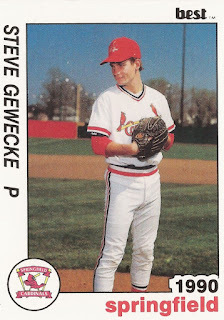 Gewecke returned to Springfield for 1990. In 38 outings, 13 starts over his second year there, Gewecke went 3-5, with a 3.61 ERA. Gewecke didn't get a third season. Gewecke eventually settled into coaching in high school. In 2010, he won area coach of the year honors from The Pasadena Star-News. The Star-News cited Gewecke's "consistency, the prowess from an unassuming lineup, and the management" in giving him the honor. "The kids are team guys," Gewecke told The Star-News. "They all are, and they want to win. We had guys with good character, and I think that was the key this year."